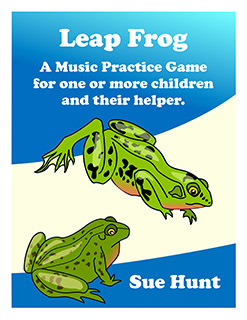 Leap Frog is a colourful absorbing Music Practice Game for one or more children and a helper. Add Leap Frog to your shopping cart and you could be ready to play within minutes. Since we all learn better and more quickly when we are enjoying ourselves, Leap Frog quickly adds value to practice time. You can customize the game to your child’s attention span, simply by using more or fewer frogs. ✓ Leap Frog provides an effective format for a practice session. It is much easier to get a young child to do a Practice Task when it is part of a game. ✓ Leap Frog gives a child many opportunities to repeat and internalize a Practice Task, and will give your budding musician a strong foundation to build on. ✓ Leap Frog gives you lots of chances to work on each hand separately as well as together. You can even customise it for all instruments with your own focus points. ✓ Leap Frog helps you to be a better helper. You will be given many opportunities to explain the Practice Task. Every time you do this, you will find yourself doing it a little differently, coming up with even more effective ways of communicating with your child. You will probably find yourself paying even better attention during your child’s lessons, making useful notes on your teacher’s instructions. ✓ Leap Frog builds focus. 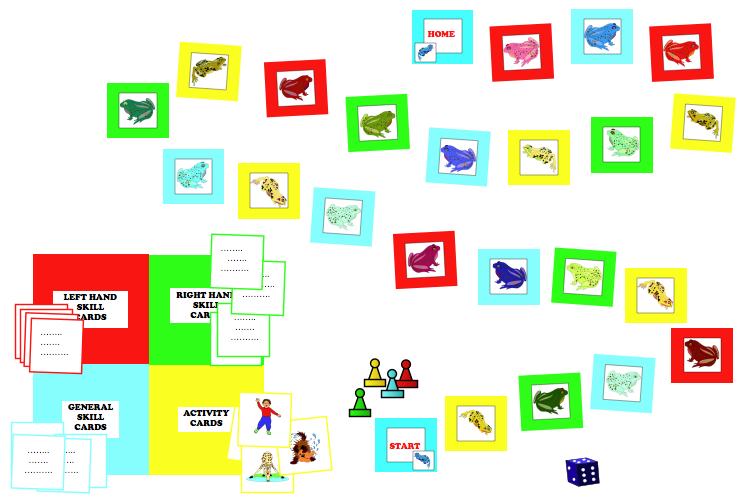 This game makes use of carefully chosen Activity Cards, which can defuse any physical and mental tensions, which sometimes build up during a practice session. ✓ Leap Frog’s activities are simple mini breaks. These are specially designed to enhance and restore the mental and physical focus of the Player, by repeatedly redirecting and refocussing the attention. ✓ Leap Frog is fun. We can get way too serious during practice sessions. Let go. Giggle a little and try the activities with your child. Laughter is a great diffuser of tension. ✓ Leap Frog even has a way to ensure that the looser, wins. Check out the scoring version. ✓ Leap Frog gives you a controlled opportunity for becoming comfortable with giving appropriate rewards or small unconditional treats during a practice session. The star cards are for the most important Task of the week. If you wish, you can attach a small reward to each, for focussing well on the teaching point (anything from a candy to a mini trinket). The treasure cards are for unconditional rewards (a cuddle works well here). Please remember, love is free, not dependent on results, or on work.